2014 hasn’t been a great year for our sporting nation so far, what with England taking an early bath from the Brazilian World Cup and Andy Murray’s defeat at Wimbledon. 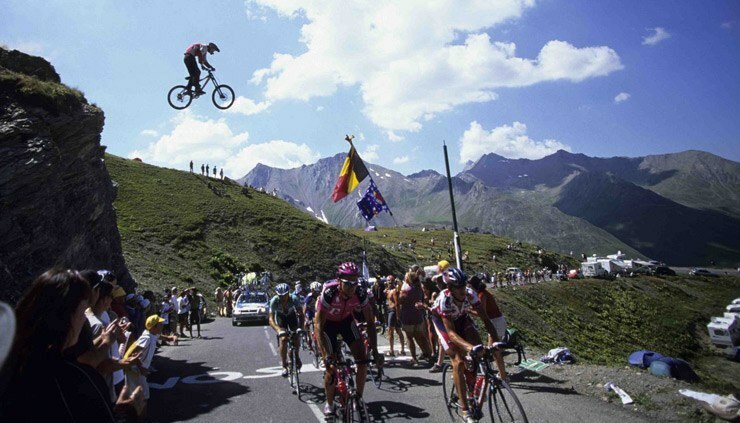 Our attention now turns to a sport we’re actually pretty good at, Cycling! With success at the London Olympics (12 medals – 8 of them gold!) in 2012, and the Tour de France in 2012 and 2013, our eyes will firmly be on top British duo (and Oakley sponsored) Chris Froome and Mark Cavendish at the 101st Tour de France which starts from England for the second time. 22 teams of 9 riders will set off from Yorkshire tomorrow (Saturday 5th July 2014) on a grueling 3600km journey over 21 mountainous stages – the thought alone is enough to leave me, an avid cyclist, exhausted at the thought! Local hero Mark Cavendish (Omega Pharma-Quick Step), aka the Manx Missile, will be looking to add to his record tally of 25 Tour de France stage victories with another win on home soil in the opening 190km stage which will also allow him to wear the leaders yellow jersey for the first time ever! 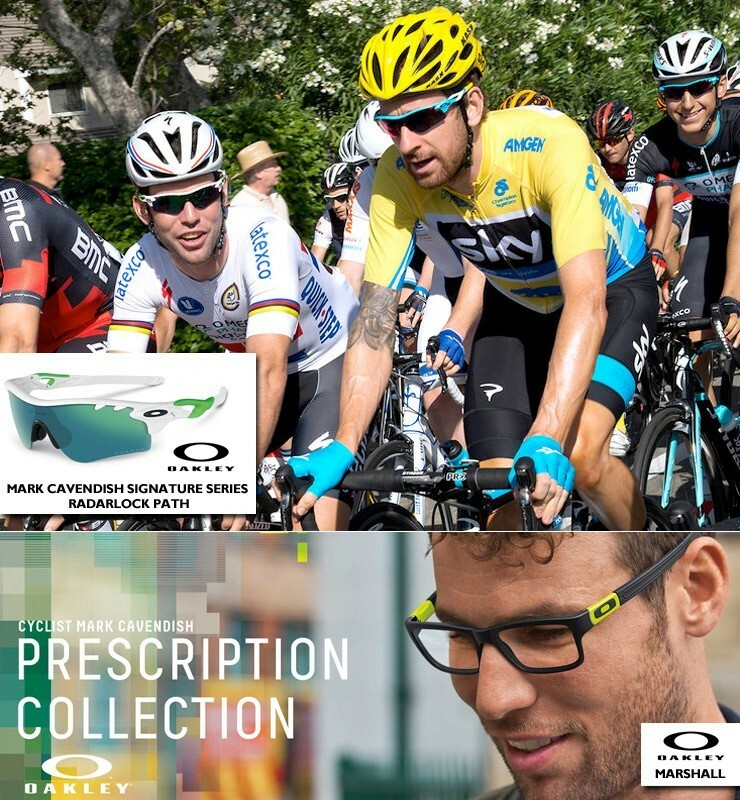 Mark Cavendish wears a pair of special edition RadarLock Path sunglasses and the stylish Oakley Marshal optical frame. Bradley Wiggins is also wearing a RadarLock Path. 2013’s TdF winner Chris Froome leads Team Sky through the stages and will be looking to retain his title but he undoubtedly faces a tough battle with his main rival Tinkoff-Saxo’s Alberto Contador. Both are strong contenders so it’s going to be interesting watching this battle unfold – expect to see the yellow jersey swap backs several times! 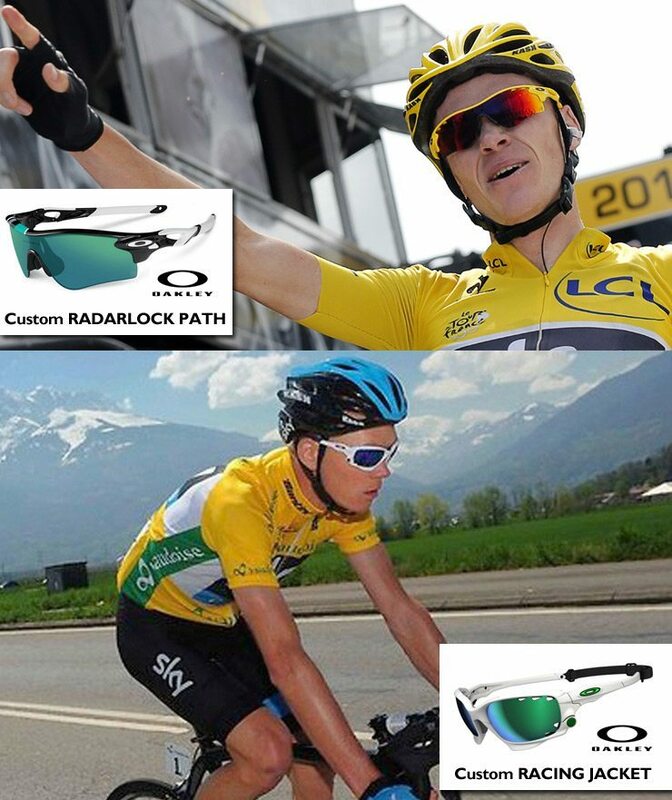 Chris Froome wears Oakley RadarLock Path and Oakley Racing Jacket. Both these are custom models. Unfortunately, the 2012 champion and Olympics hero Bradley Wiggins has been left out of Team Sky’s TdF campaign and will instead focus on preparation for track events at the Commonwealth Games in Glasgow in July 2014. Will Froome pick up this years title or will Contador get the better of him? How many stages can Cavendish grab? It’s going to be a fascinating 3 weeks of wheel to wheel action! aller, aller, aller! If you’ve ever wondered what it’s like to be in the middle of a peleton reaching speeds of over 60kph, check out this on board video, it’s insane!! Are you a keen cyclist or mountain biker? We highly recommend you wear good quality eye protection while riding. Be sure to check out our sunglasses that are great for riding here.